Hello! Welcome to our Frequently Asked Questions section. Below is a list of answers to some of the most common questions when renting a dumpster. We hope you find this section helpful, however if you’ve any other questions or concerns that we’ve not covered in our FAQ’s section, feel free to contact us and we will be happy to answer to your queries. 1. 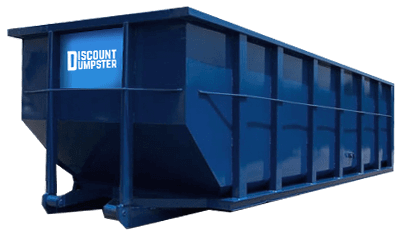 What sets Discount Dumpster apart from other dumpster services? There are many reasons which make Discount Dumpster the best. Here are some of the factors that set us apart from the rest. We use smaller trucks which can easily fit into tighter smaller areas. 2. How much does it cost to rent a dumpster? The cost of the dumpster depends on various factors like size, weight of the debris, local taxes, fees and the actual duration of the rental period. The exact price of the dumpster mainly depends on the clients requirements and varies according to the customers’ location. To learn more about the pricing details please check here. 3. How do I pay for my dumpster/ what are the payment options accepted? We accept payments by all major credit cards like MasterCard, Visa, American Express and paypal. 4. Do I need to pay a deposit in order to rent a dumpster? No we do not require a deposit to schedule a delivery. We do require payment for the dumpster prior to the delivery. 5. Do you offer discounts? Yes! We offer interesting deals and discounts from time to time. We also offer seasonal promotional codes. Simply check Deals and Discounts page to avail the latest deals offered at this moment. 6. What size dumpsters are available? We offer dumpsters of many sizes including 10, 15, 20, 30 and 40 cubic yards. To know more about the volume and the weight limits please check here. 7. How do I rent a dumpster? The process for renting a dumpster is very easy. Simply contact us by phone or email and we will help you choose the dumpster suiting best to your needs and will guide you set up your order within minutes. 8. Why should I use Discount Dumpster? Discount Dumpster offers you best of the best dumpster renting service at affordable prices. We provide all our clients property owners, contractors or business owners with fast and courteous waste disposal services at low, flat- rate prices. Simply get in touch with us today to rent a dumpster at reasonable price. 9. How long does it take to rent a Dumpster? 10. What type of “stuff” can’t be put in a dumpster? We strongly advice you that hazardous items are prohibited from being tossed in dumpsters. A short list of the items to avoid include: tires, paint, oil, refrigerants, aerosols, toxic chemicals, car batteries and flammable/combustible substances. 11. Do I need to be home when the dumpster is dropped off? It is not essential to be present when your dumpster is delivered. However we suggest that please make sure that the area where you want the dumpster to be delivered is clear. And if you have any special directions or placement requests it is advisable that someone is present to be sure that dumpster delivery goes on smoothly. 12. How high can I fill the dumpster? The dumpster can be filled to the rim however please take care that no pointed items are coming out of the dumpster. 13. Will the Dumpster damage my driveway or lawn? No! Our Dumpster Delivery Experts always place boards under the bins so there is no risk of damaging your driveway or lawn. In case if this is a concern to you we strongly recommend having pieces of plywood ready when the dumpster is delivered to place under the wheels of the dumpster to avoid any damage. 14. Who do I call when I am done with the Dumpster? When you are ready for a pick up simply call us at 123456789 and we will assist you to schedule the pick up timings according to your convenience. 15. How long do I get to keep the Dumpster? You are allowed to keep the dumpster for the entire duration of the contract. Please note that rental periods vary from client to client. If you feel that your project may last longer than the agreed upon contract period we strongly recommend that please let us know and be aware that there will be additional rental fees which will be added to your original invoice. 16. What happens if I need additional time? extend your rental period. You can extend your Dumpster rental duration by paying additional rental fees. 17. What size dumpster do I need? 18. Is there a weight limit on the Dumpsters? Yes! There is a weight limit on Dumpsters which mainly depends on the size and volume of the Dumpster. Here are the details on weight limits. 19. Do I need a permit for a dumpster? You will need a permit for a Dumpster in case when you intend to have the dumpster dropped off on a street or any other public property. Please get in touch with us and we will be able to assist you if you’ll need a permit or not; before you set up your order. 20. How do I load the dumpster properly? While loading the Dumpster it is strongly advised to load it as evenly as possible as it helps to fit in more debris. Please take care that you do not overload the dumpster. It is also very important to make sure that nothing is hanging over the side or sticking up or pointing on the top of the dumpster. Also make note that will be charged an additional fees in case you overfill the dumpster. 21. How much does an empty dumpster weigh? The weight of dumpster varies according to its size and volume. Please check the Dumpster sizes page to learn more about it. 23. How much notice do I need to give when ordering my dumpster? We generally like to have 24 hour notice for delivery or pick up but in most cases we can provide same day service or next day service. 24. I still have other questions. How do I get in touch with your staff?